I can remember swimming in the Waikato River at Cambridge on a daily basis during my summer youth, but one look at the Waikato River at Mercer reminded me why that was no longer possible. 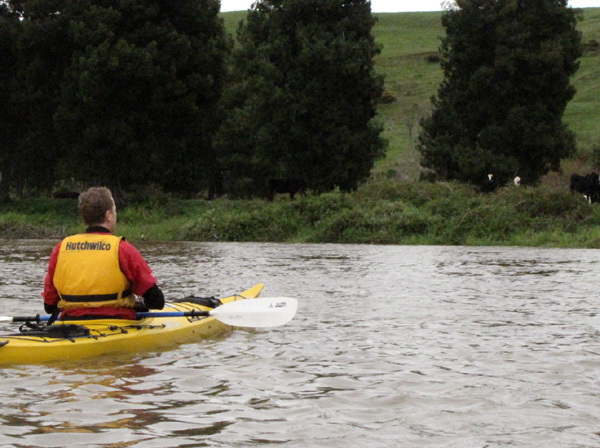 Green Party co-leader Russell Norman comes eye-to-eye with some of the cows that live on unfenced farms on the river. High levels of faecal waste, zero visibility, phosphates and nitrogen all added up to a thick brown soup! My misspent youth was spent tubing down the river, hurling myself off bridges and snaring eels in this river – now this seemed utterly unappealing given the colour and contents of the river. The almighty 425km Waikato River starts its journey at Lake Taupo. Lake Taupo is a super-volcano (or caldera) that blew 26,500 years ago to form a crater and quickly transformed into a lake as it pooled water from over 30 rivers and streams. The water from the lake then charges down the Waikato, through the Huka Falls then passes through 8 hydro stations on its way to Port Waikato on the edge of the Tasman Sea. Executive member Jon Wenham and I joined Russell Norman from the Green Party as part of his Waikato leg of their Dirty Rivers campaign. We kayaked from Mercer to Tuakau which passed by the water intake for water supply to Auckland. Along the way we passed several locations where stock were grazing right next to the river and drinking directly from the river itself! The recent snapshot of the Dairying and Clean Streams Accord was a catalyst for this trip. Eight years into this freshwater agreement and only 2 of the 5 targets have been met. It appears there are a significant number of farmers letting down the majority, and all other New Zealanders! The mismanagement of the bovine citizens to this area is the cause of much of this pollution. One cow produces 14 times more faecal waste than a human, and unfortunately much of the waste ends up in the Waikato river – it’s essentially a large wastewater system. Fencing and riparian planting can allay some of these problems but we’ve been sluggish in ushering in this new era of green farming. Massey University’s Freshwater scientist – Mike Joy – is has been ringing the alarm bells for years – he can’t just sit by and watch the extinction of all of our freshwater fish by 2050! The meander down the river gave us a chance to discuss possible solutions including best farming practises, greater wetland protection and local partnerships. One local partnership that has re-forested the banks of the Waikato and helped us to understand the biology of our fish is that between the operators of the Huntly Power Station Genesis Energy, the local community and Forest & Bird. Although there are obvious concerns over this carbon-emitting source of energy, the work that Genesis has done since the 1980s on our freshwater fish populations is unprecedented. Like any coal or gas-fired power station it requires a decent amount of water to cool off and it gets this water from the Waikato river. It not easy to sort the water from the fish, so in an attempt to understand how to mitigate sucking up fish, it’s done several longitudinal studies since the 1980s – giving us a much better picture of the population, biology and life-cycles of our freshwater fish and our critically long-lived longfin eels. Not only has this informed the construction of their fish passage to help some of the fish safely pass, it will ultimately led to better freshwater management! It is so sad to see our beautiful blue/see-thru rivers become like a thick brown soup! About 3-4 years ago my partner and I found the most stunning spot out the Turakina Valley where two gigantic logs criss-crossed and led down to the waters edge. It made for the perfect picnicing and sun bathing spot – not to mention the absolutely stunningly clear water (and the odd trout!). Now everytime we stop there we are greeted by a dark murky mess. I can’t believe how in such a short span of time our favourite spot is no longer the beauty it once was! Yeah, it’s happened to all my favourite spots from childhood – excess nutrients leading to excessive algae bloom. I suppose there are a few eels still alive in these waters. I can’t really justify bringing children into a world where they are unable to enjoy swimming in the rivers. It seems quite cruel.